Spinaleze is a therapeutic pillow designed to provide comfort and support to help you get a comfortable night's sleep. The Spinaleze pillow come in a range of sizes so you can select the option for you depending on your preferred sleeping style and your height. 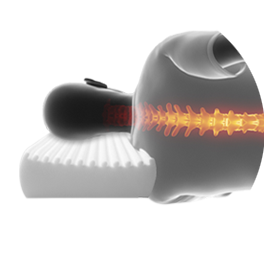 A product of 10 years of research, the Spinaleze pillow has been designed to contour and take shape around your neck to provide maximum comfort and support whilst you sleep. The specially designed corrugations across the top surface of the pillow cradle the neck while allowing free flow of air around the neck. The bottom surface of the pillow also allows for constant circulation of air. The Spinaleze pillow contain a hand crafted neck recess to try and maximize the contact between the neck and the pillow. What is Spinaleze pillow made from? Spinaleze pillow is made from a unique lightweight aerated visco elastic material with Ultra Fresh. Ultra Fresh is an antimicrobial and anti dust mite material that helps keep your pillow healthy and hygenic. Who is Spinaleze pillow suitable for? Spinaleze pillow is most suited to back or side sleepers. If you have sleep apnea you can use the Spinaleze pillow to provide comfort and support whilst you sleep. 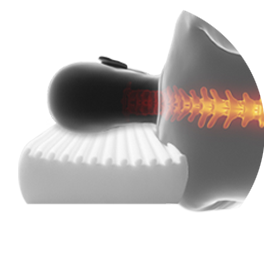 Take a look through some common questions and answers about the Spinaleze pillow. Which Spinaleze pillow should I use if I sleep on my back? The Spinaleze Low Profile Pillow would suit back sleepers regardless of height. The Spinaleze pillow will mold and shape around the head and neck, just make sure the Spinaleze tuck’s in close to the shoulders and neck. If your current pillow is quite high, then you may select a Medium Profile for comfort. Which Spinaleze pillow should I use if I sleep on my back AND my side and I am under 6ft? 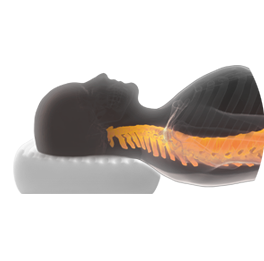 The Spinaleze Medium Profile Pillow would suit people under 6ft who sleep on their side. If you sleep occasionally on your back (say about 30% of the time) you will need to rest the tip of your shoulders on top of the Spinaleze pillow when sleeping on your back. The Spinaleze pillow will mold and shape around the head and neck , just make sure the Spinaleze tucks in close to the neck. Which Spinaleze pillow should I use if I sleep on my back AND my side and I am over 6ft ? The Spinaleze High Profile Pillow would suit people over 6ft in height who sleep on their side. Where can I see the Spinaleze Pillow? If you are from South Australia and are interested in buying a Spinaleze pillow, please contact us on 1300 925 387 and we can arrange to have one shipped to you. Does the Spinaleze pillow come with a pillow case? The Spinaleze pillow comes with a quality fitted 100% cotton cover protector pillow case. You may also use your own pillow case for the Spinaleze pillow. Standard pillow cases fit the Spinaleze pillow. Is the Spinaleze Pillow suitable for children? The Spinaleze Low Profile Pillow would suit children under 12, regardless if they sleep on their side or back. The Spinaleze pillow will mold and shape around the head and neck, just make sure the Spinaleze tuck’s in close to the neck.